This race, first organised in 1978 by British sailor Bob Salmon, has long been the proving ground for both boat design ideas and for potential skippers for the big solo and double handed races, including the Vendee Globe. 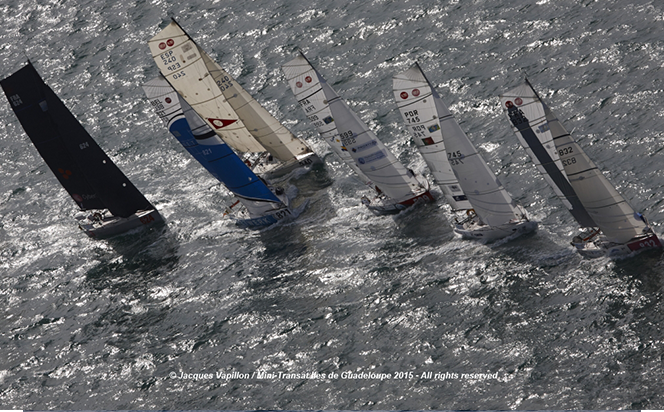 Despite it’s British origins, for many years the race has been French dominated, but the current edition has skippers representing 14 countries across three continents. 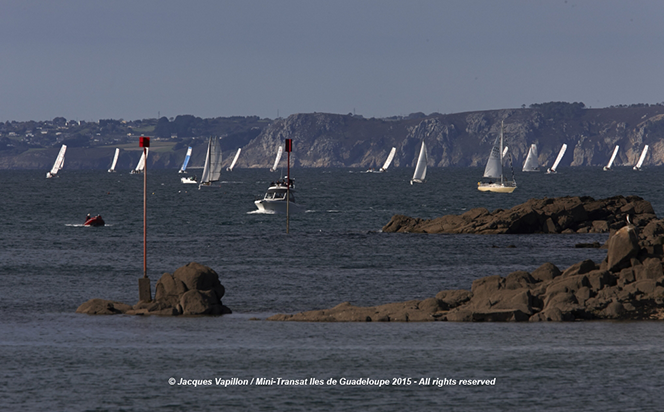 The 84 skippers in their tiny 6.5m long yachts left Douarnenez in south Brittany bound for the Canary Islands, some 1,250 miles to the south in mid September. Many saw winds of up to 40 knots off Cape Finisterre in northwestern Spain, proving just how tough these little boats can be. 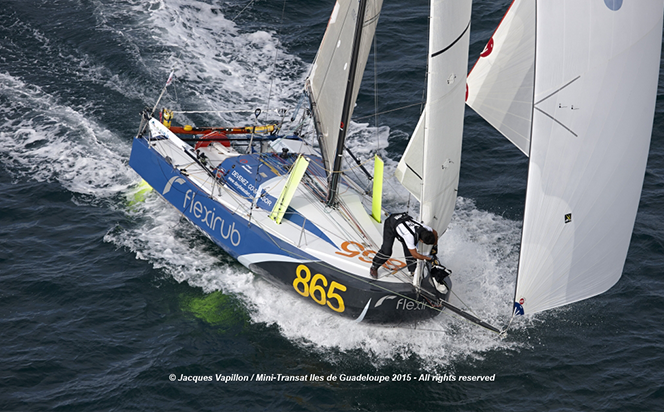 Nevertheless, a number had to pull out of the first leg, including Fidel Turienzo’s Satanas, who headed to the Portugeuse port of Sagres under jury rig after dismasting, and Romain Mouchel who returned to Lorient after breaking a finger. The first boat to reach Lanzarote was Davy Beaudart’s Flexirub – Cherche co-Sponsor, which finished in just 6 days 19 hours, averaging 7.66 knots, or 184 miles per day to win the proto class for one-off designs. 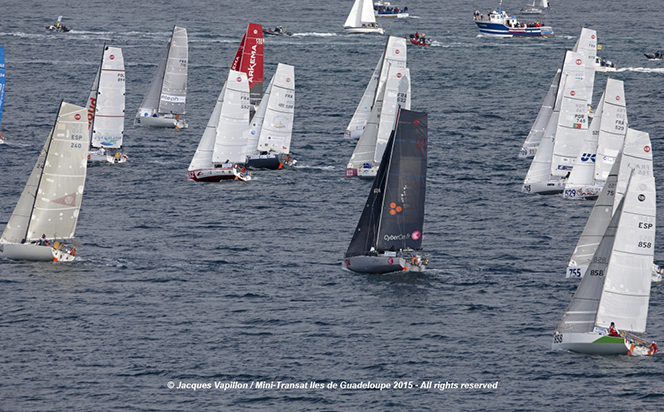 In the Series class for production boats, Ian Lipinski’s Entreprise(s) Innovante(s) took victory in 7 days 14 hours 31 minutes representing an average speed of 6.82 knots. He took the lead near Finisterre, in the early stages of the leg, and held on to it right to the finish. “I feel really good, the leg was just incredible. We had such a perfect weather, we are going to pay for it on the second leg, it was beautiful. I had lots of good moments. For me the best was when it got calmer and the temperature started rising: the great happiness. At the beginning, I cried, I saw the race lost when Tanguy (Tanguy le Turquais (Terreal), pushed me to keep going. Then I was with the leaders group and then leading the Series class and I was so much better”. 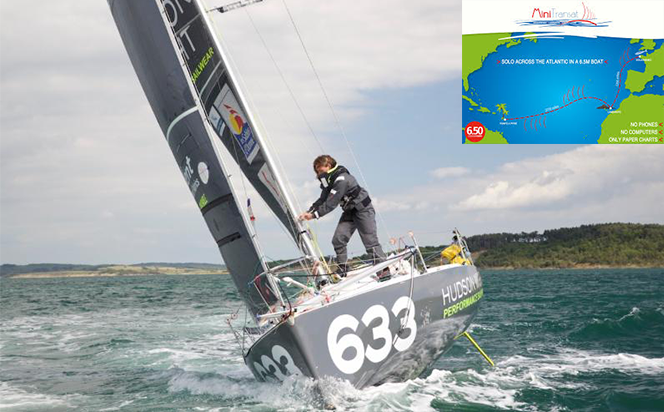 After a long stopover in Lanzarote, the fleet is due to restart on October 31 for the final leg, 2,770 miles measured directly, across the Atlantic to the Caribbean island of Guadeloupe. “When I leave Lanzarote my priority is to crack the hardest tactical point of the race, getting into the trade winds – much of the overall result of this race is going to be about getting in to these winds asap,” says Lizzy Foreman, skipper of Hudson Wight, the best-placed female skipper in the series division in the first leg and one of three Britons in the race.